Have you heard of Henry Holland? Are you hot for Iceland? Are you proud of your Icelandic roots? Do you want to get a sense of Iceland in 1810? That’s 62 years before a lot of our ancestors made the perilous journey to Amerika. But even those who were 35 years old or 25 years old or 5 years old were leaving an Iceland that had changed little from when Uno Von Troil visited in 1772. They were leaving an Iceland that had changed little from when Henry Holland traveled around Iceland in 1810 with his companions, staying at farmhouses and in churches, fascinated by Iceland’s famous geology but, for us, more importantly, describing the people and places where he stayed. Who was this Henry Holland? 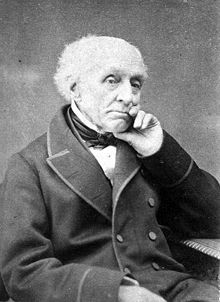 He was, according to the cover of his book, The Iceland Journal of Henry Holland 1810 “one of Victorian London’s most celebrated physicians and most tireless travellers”. This is a hospitality that is recounted time and again over Holland’s months of travel in Iceland. Holland is a trained observer. He misses nothing. He is curious about everything. And, the Icelanders are every bit as curious about him and his companions. Most of them have never seen an Englishman, may never have seen a foreigner unless it is a Danish merchant. No wonder everyone came to see the Englishmen, these strange creatures from a far country doing the strangest of things. Going to the lava beds and chipping off pieces of rock, bringing them back and wrapping them in paper. They must have thought the Englishmen quite mad. Here was a country made up of lava. Lava was everywhere. And these strange men were chipping off pieces to take back to England. In Grundeviik, the bondi, a M Jonson, who is the principle farmer, is elderly. When Holland questions him, he says that “we were the only Englishmen, who had visited Grundeviik…He recollected to have once seen a Frenchman there“. These are our people. Maybe not in a direct line of ammas and afis, but our ancestors were just the same. Most of them had not seen a foreigner. Most of them had not traveled far from the farm on which they lived. Travel was still difficult and dangerous, often impossible. When you read Holland’s journal and he daily recounts traveling in the pouring rain, the fierce wind, the dangerous bogs where men and horses could be mired and die, the snow in the mountains even in summer, the cold even in summer, you begin to understand what it meant for our people to decide to leave their farm, travel for days to the nearest harbour where they could get passage on a boat to England or Scotland. These are still the days of the sailboats. Everything depended on the weather. At the beginning of Holland’s journal, he says they were delayed for over a week because bad weather delayed their ship. When they are ready to leave Reykjavik, weather, once more, delays their leaving and even after the ship sails, the weather keeps them from making any progress. The storms are so bad that they decide to get off the ship at the earliest opportunity. Sixty-five years would pass before our ancestors would reach New Iceland but they still endured the conditions Holland describes in 1810 because so little had changed between 1810 and the 1870s. They endured the travel he described because all travel was still on horseback. Travelers stayed in tents or in unheated churches.They rode in rain. And wind. And cold. There were many foreign travelers after Holland who wrote about their experience exploring Iceland but he is well worth reading because his journal is detailed, specific, intelligent and reading the works of the early travelers and the later travelers gives a clear picture of a country trapped in time. A country where there was little opportunity to live the better life promised by Amerika. 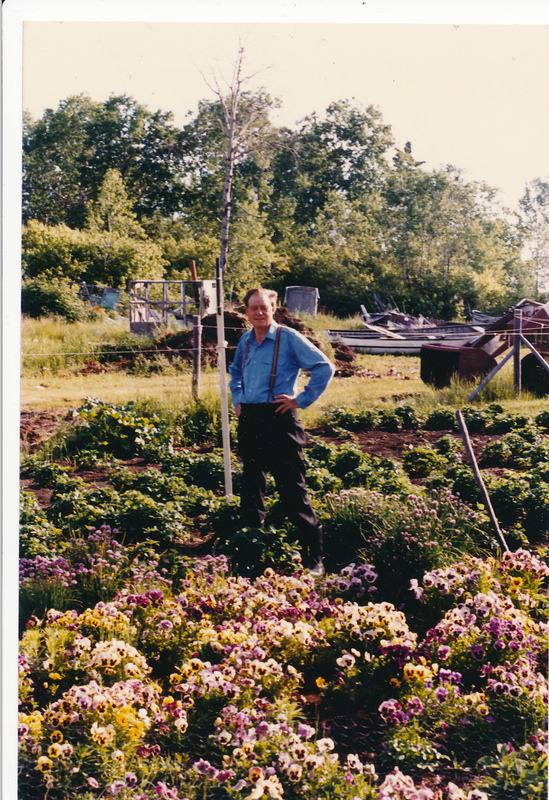 This is my father in his garden at Frog Point, Humbug Bay, Manitoba. It is north of Hecla, nearly at Pine Dock.The government launched a plan at one point to see if people could grow gardens in these northern communities along the lake. They should just have gone to my father’s fish camp and taken a look. he didn’t need any grant. Last summer, after being in Manitoba for three and a half months, when I returned to Victoria, I found an azalea and a rhododendron dead. It had been a dry summer. They were beautiful plants, valued parts of the garden that fronts my house. I have no lawn. Just a garden of mixed shrubs and flowers. Also, when I left for Manitoba, my fig tree was covered in new figs. When I came back, the figs had dried up and fallen off the tree. Perhaps it is vanity but Victoria, given its climate, is a city of garden proud people. Plants of all kinds flourish here. When I first moved to Victoria in the early seventies, I was amazed to discover trees and flowers that we’d had in southern Missouri. The climate allows extravagances such as the palm tree in Playfair Park. People grow palms simply because they can. More spectacular, though, are the tulip trees, astounding fountains of flowers. The rhodos at the University of Victoria are breath taking. Not to garden seems churlish. Only the blackest of thumbs couldn’t make something grow. I come from a family with two stellar gardeners. My father, surprisingly, a rough, tough commercial fisherman, loved to garden. At his fish camp along the west shore of Lake Winnipeg, he grew masses of flowers, rows of vegetables. The soil that lay over the limestone had been undisturbed for eons and he had all the fish offal he could possibly use for fertilizer. My Irish grandmother was the other gardener but while she grew some flowers, her heart’s desire was vegetables. Her city garden, created under difficult circumstances, flourished, was laden with string beans, peas, was packed with carrots, beets, parsnips, potatoes. Her side yard provided plums from wild plum trees she’d brought from the forests around Gimli. Rhubarb and strawberries flourished. That is why, too busy editing and writing, too busy going to Manitoba for Islendingadagurinns and ice festivals and holidays, I’ve left my garden untended, unweeded, unwatered. In spite of that the Grape Hyacinth have provided a wonderful display among a mass of white flowers the name of which I do not know. The daffodils look like they are on steroids. The rhodos, after looking limp last fall, are bursting with large red blooms. However, they all show the signs of stress from last summer. I swore before I left this year, I’d have an automatic irrigation system in place. Those who don’t know me won’t understand what a brave and foolish statement that was. Mechanical systems defeat me. Fortunately, there live across the street a couple who are exceptional gardeners. Someone recently said to them, “If I were getting married, I’d want to get married on your lawn.” You only need a glimpse at their “lawn” to understand why. When I mentioned to David that I was going to put in a micro watering system, he took me around his yard to show me how such a system worked. Then I went off, with his advice, to buy the component parts. Knowing nothing, when a salesman sold me the wrong plastic tubing, I bought it. It put me back a day and after trying to make the tubing work, David went with me to HD and we were told, oops, sorry, wrong tubing. And, no, we don’t have any of the right tubing but if you drive to Rona in Langford (this is quite a distance) they have some. End of day one. Today, I left early for Rona, found the correct tubing, plus some more bits and pieces sold separately and after having watched what David did yesterday, went to tackle putting the system in place. Fortunately, my neighbour saw me and came over. And, for the next four hours, did most of the work required to get the system in place and working. We both got soaked. It was chilly. Didn’t matter. I’m a bit thunderstruck. I’ve always been lucky with my neighbours but help for two days in a row getting in an irrigation system is beyond anything I’ve ever experienced outside of small town Manitoba. This is, after all, the big city. Good neighbours make a community. If there are more people here who are like my neighbours across the street, I really have moved not just into a house, but into a community. The letters Uno von Troil sent to his patron are, for me filled with intriguing details. Unfortunately, there are no footnotes to expand some of these details. Probably the most interesting thing he says about the economy of Iceland is that in spite of the harsh laws, the Icelanders manage to trade in smuggled goods. Iceland has a rugged coast. 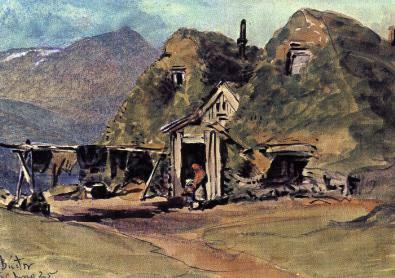 There are many possible harbours where a boat can anchor while word can be spread from farm to farm and the farmers can load up their horses with sheep skins, wool, preserved meat, knitted goods, wadmal, and eider down, anything that they might use to barter for desperately needed goods. Remember, there were no mineable metals in Iceland. Everything made of metal from horse shoes to sewing needles had to be imported. Every farmer, it was said, was his own blacksmith but blacksmiths need coal, charcoal, and metal bars that can be shaped to whatever is needed. Since grain could not ripen, barley, rye, and later, rice, needed to be imported. The Icelanders preferred rye biscuit, probably because the biscuit could be stored for long periods of time and, unlike the grain and flour, were not moldy. According to von Troil, the Dutch smugglers brought better quality goods. Why wouldn’t you deal with the smugglers if they gave a better price for your goods and provided you with higher quality items? The king could collect his 6000 rix dollars for providing a license, and instruct the trading companies to send 24 to 30 ships a year to Iceland and even instruct a company to provide good quality goods but the king was in his court and Iceland was far away and more of a nuisance than a benefit. Companies driven by the desire to make their owners rich weren’t good at self-regulation any more than they are today. Horsemeat in your hamburger isn’t a new phenomenon. Breast implants with poor quality silicon that leaks isn’t a new problem. If a merchant ship that has an exclusive license to a harbour so there’s no competition sells you rotten grain, low quality metal, poor cloth, watered brandy and then sails away there’s no place to complain to or to which to return the inferior goods. What we need is someone like Jonas Thor to slow down long enough to translate descriptions of this smuggling. If Dutch ships were being seized then there will be court records of the seizures, the people involved, the penalties. A translation of the laws regarding smuggling would be a great help in understanding conditions of the time and the risks that our ancestors took to obtain decent goods to help them survive the coming winter. If not Jonas, then surely there must be others, university students, graduate students, history buffs who could unlock the lives of those people we celebrate at every Icelandic Festival. 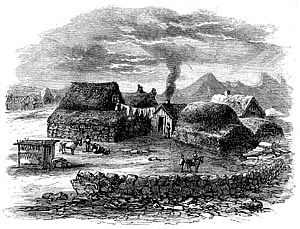 I’ve been told that some people don’t like being reminded of how poor our people were, what terrible conditions they often lived under, how harsh was the weather. To ignore these things is to cheat our ancestors of the credit they deserve for their accomplishments. How dreadful! People who faced what seemed like impossible odds just to survive, who, generation after generation, made lives for themselves in conditions that required fierce strength and determination, were heroic. Getting out of bed in the morning when there is no food, no heat, the very real possibility of dying from hunger and cold and not giving up is heroic. Those who stayed in Iceland, determined to make it a better place, were heroic. Those who risked everything by travelling to foreign places were heroic. They were heroic because of the obstacles they overcame. Pretend that those obstacles didn’t exist and you strip them of their heroism. Their enemy wasn’t a foreign army. They did not face lines of troops with cannons and bayonets. They faced just as deadly enemies, though: incredibly bad weather, commercial exploitation, political neglect, natural disasters, rampant diseases. They died, at times, in great numbers, facing these enemies. They were cut down in the thousands by hunger and disease. They didn’t give up. If we are going to celebrate the heroism of these people, we have to tell the stories of the battles they fought, the battles they lost and won. 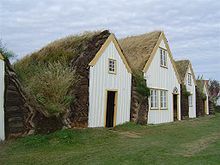 Many of us, I say us, because it was certainly true of me, had no idea of what life was like for Icelanders in the 1700s and 1800s even though it was social and economic conditions during these times that led to our ancestors leaving Iceland the latter part of the 1800s. What I heard, repeatedly, was that our ancestors left Iceland because of the volcanic eruptions. I’ve heard this repeated time and again, as if it were gospel, both in private conversation and in public speeches. While it is true that the effects of volcanic eruptions contributed to people making the decision to leave for North America, another hardship piled upon previous hardships, there was much more to it than that. Uno von Troil, writing his Letters on Iceland, based on his visit in 1772, gives a summary of what trade was like for the Icelanders. Some of the conditions he mentions in brief (unfortunately, he does not elaborate) give us a glimpse into life for our lang (x6 or so) ammas and afis. Von Troil points out that over the centuries there had been many changes in the way that trade was conducted with the Icelanders. What is obviously the major problem is that the trade was not under the control of the Icelandic people. The days of Viking ships were long past. 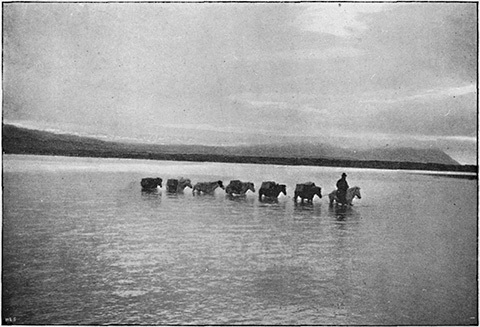 The Icelanders were in no position to carry their goods to various markets. He points out that until around 1400, the Norwegians were virtually the only people trading with the Icelanders. What fish the Icelanders didn’t eat or export in their own ships (the Icelanders still had ships with which to export goods), the Norwegians bought. The English took over this trade, he says, until the Reformation. Although the mention of the English is just in this one line, the relationship of the English to Iceland waxes and wanes but never stops. It is long and, sometimes, troubled relationship. During the Reformation, trade with Iceland was given to the Germans, particularly traders from Hamburg. Christian IV prohibited the Hanseatic League towns from trading with Iceland in 1602 and gave the right to trade to Copenhagen, Malmo and some other cities that were controlled by Denmark. The Iceland company had the trade rights from 1620 to 1662. In von Troil’s notes, I found a most interesting comment about the Iceland Company and the Turkish raids. We all know about the pirate raids that resulted as a large number of Icelanders being taken and sold as slaves in Algeria. According to von Troil, the king was upset with the Iceland Company because not only had the company, in return for their exclusive license, promised to provide the goods necessary for the Icelanders but to protect Iceland from marauders. Von Troil doesn’t explain the situation in detail but he says that the people who owned shares in the company were paid for their stock holdings but those people who had 1000 rix dollar shares were only given 500 and those who had 200 rix dollar shares got nothing. The company had paid the king for every trading port plus two rix dollars to the governor. It also contributed to the king’s “magazines” on the Westman Islands. After the Iceland company was done away with, the trade of every port was auctioned off to the highest bidder every six years. However, he says, since 1734, a trading company has been given exclusive trading rights to the Icelandic ports for a yearly sum of 6000 rix dollars. In return for this payment, the company is supposed to send 24 to 30 ships a year. They bring (or are supposed to bring) grain, bread, wine, iron and wood, etc. There are 22 trading ports. There they get fish, meat, butter, blubber, skins , wool and woolen goods. He says that he doesn’t know if the trading company actually makes much money from the trade. The reason for that, he says is that the Dutch, illegally, bring much better goods to trade with the Icelanders. The Icelanders, illegally, sell their goods to the Dutch. This is regarded as smuggling and a number of Dutch ships have been seized. The legitimate trading company knows that smuggling and illegal trading is going on because the Icelanders bring such a small amount of goods to trade with them. Von Troil mentions that at Reykjavik there is a woolen “manufactory, where twenty or thirty workmen are employed” but he does not explain what it is that is manufactured. Is it wool being readied for market or is it finished products? Surprisingly, he says that there are only a few looms here and there. Later travellers make reports of looms but do say that they are small and primitive compared to the looms in Europe. The state of the Icelandic economy can be judged by von Troil comments on money. He says there is so little actual money that in the entire country can’t amount to more than a few thousand rix dollars. The Icelanders keep their accounts not in money but according to yards of wadmal and number of fish. Forty eight two pound fish are worth one rix dollar. Twenty-four ells (about two to two and a half feet) are worth one rix dollar. He says that you can buy a horse for 150 fish. So that would be about three rix dollars. You can buy a farm for 6000 ells. Think of that as 1000 yards of woven cloth. So, there you have it, in the lines and between the lines. The Danish company that was supposed to protect the Icelanders in return for their trading license, didn’t, and Icelanders were killed and taken into slavery. Profit before responsibility. Not by the king but by the trading company. The goods supplied by the later trading companies was often of poor quality. This did not improve with time. Later reports in the 1800s make note of the fact that some ships, to increase profits, did not even bring poor goods to trade, but nothing except cheap Danish brandy. Your ancestors, if they could, in the face of harsh penalties, traded smuggled goods because they were of better quality. One must, of course, be wary of historical documents, particularly personal papers, for much is included that is hearsay. For example, von Troil says of the Icelanders kidnapped by the Turkish pirates that most were returned to Iceland. We know that is not true. Still, his observations are interesting and informative and give us some sense of what life was like for those great (x6) ammas and afis of ours, and a sense of the social and economic conditions that led, eventually, to our people going to the harbours and getting onto English ships to begin their journey to Amerika. When Dorothy was caught up by a tornado, she was carried to Oz. You, however, after having drunk a tumbler or two of brennavin were transported from Islendingadagurinn in Gimli to Iceland in 1772. 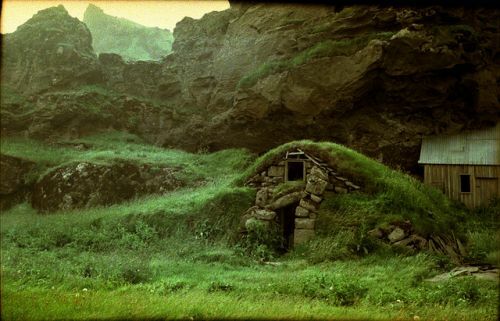 As you staggered along a mountain path, grateful only that there is no horizontal rain this day, you have found a turf and lava farmhouse with a front made from driftwood. The farmer and his wife, not quite sure what to make of this odd looking stranger have found a place for you to sleep after the eldest daughter, bewitching lass that she is with her long blonde hair and her pale blue eyes, has helped you off with your clothes. She’ll hang them up in the hope that, in the morning, if they’re not actually dry, they won’t be dripping wet. They’ll smell a bit smoky because the most likely place for them to be hung is in the cooking area along with the meat and fish that is also hung there. There is, given the way these things work, tornadoes and brennevin that is, a good chance that someone in that house where you are going to sleep jam packed with ten other people, is one of your ancestors. So, just in case it’s the beautiful blonde wench who helped you off with your clothes, and she’s going to be your lang lang lang lang lang lang amma, keep your licentious thoughts to yourself. In any case, what are these people like? According to von Troil, the Viking age is long gone. Instead of war, plundering, burning, destroying on their way to Valhalla, they’re now content to take care of their sheep and cows. The Icelanders defended themselves against their powerful neighbours, not by arms but by historical knowledge. They put great effort into knowing their own laws. Current Icelanders prefer fishing and agriculture to war. So, there you have it, from a man who is there, on the spot, you aren’t going to find any Vikings. You are going to find farmers and fishermen. He says the Icelanders are middle-sized and well built but not very strong. The women are “ill-featured”. That’s surprising but given their diet, the constant diseases, particularly of the skin, it shouldn’t be all that surprising. He says that where he is, the men no longer have beards but if you are in the northern part of the island, your host and the other men living in the house are likely to have beards. Our host and the other farmers in the area have fewer vices than van Troil has seen among the wealthy in Europe. Theft is seldom heard of. Nor are the Icelanders inclined to get drunk. But there have been fines and other punishments meted out for drunkenness. In spite of what von Troil says, if you have some brennevin left in that bottle in your pocket, no one would turn down a drink. Particularly as what most Icelanders get to drink, if they get to drink, is cheap Danish brandy. Now, here’s the tricky part, that beautiful blonde daughter of your host, the sixteen year old with the long blonde hair and the startlingly blue eyes and the smile that makes your heart go thud, thud thud, but who just might be your lang amma, is going to kiss you on the mouth. The Icelanders are always kissing each other on the mouth. Icelanders are the most kissing kissers the world has ever seen. You’ll be expected to kiss the husband, the wife, the children, the other sisters, grandma, even if she’s got a mouthful of chewing tobacco. Von Troil says that Icelanders are faithful to their government and very religious. They are also obliging and faithful. They are superstitious, so don’t do any magic tricks. It wouldn’t do to be identified as an agent of the devil. They are so attached to their own country that is not understandable. Even those who have a chance for a much better life in Copenhagen usually return to Iceland. In spite of all these wonderful qualities, they are not ambitious. They just repeat what they have always done even though their lives could be made better with some obvious improvements in the way they fish or farm. They aren’t cheerful by nature so, if your host seems phlegmatic and taciturn, don’t take it personally. If you are lucky enough to speak Icelandic, you can join in and listen while they take turns reading or telling stories or sing. However, he says, the singing is dreadful. If you are lucky, during your brief stay in 1772 in Iceland, you might hear someone play the langspil or the fidla. The fidla will have two strings made of horsehair. You might see them play games or do a ring dance which he called ringbrud or you might see horse racing. If you play chess, you’ll be a welcome guest. The Icelanders are already famous for playing chess. When you leave, walking down that mountain path more steadily to whatever portal will bring you back to Gimli and Islendingadagurinn, you’ll be grieved by the farm people because you will be the only non-Icelander these people will see in their lifetime, unless they are fortunate enough to be among those who go to the harbour when the Danish trading ships come in. Most will never see a foreigner. I hope you memorized the name of the farmer and the farm. Then you can do some genealogy and track your ancestors back and see if that pretty blonde really was your lang amma and, if not, wish you had spent some time kissing her behind the sheep pen. According to Uno von Troil, the houses in different parts of the country are different. On the north side of the island, he says, the houses are very bad. The only decent places are those of the governor at Bessestedr, the physician’s house at Seltiarnarnes, and the sheriffs at Wido. (his spellings)These houses have been built of stone and paid for by the Danish king. In other parts of Iceland, the buildings are made of drift-wood and in other places of lava with moss stuffed between the lava. In some houses, the walls are lined with wood. The rafters are covered with sod. In places where people can’t get wooden rafters, the ribs of whales are used. However, the whale ribs aren’t free. They are more expensive than wood. The walls are about nine feet high and the door is not high. If you come into one of these houses, you’ll find yourself in a hallway that leads to a first room with some holes in the roof. These will be covered with a skin stretched over it to let in light. At the far end of the hallway there will be a room where the women do their work and the farm owner and his wife sleep. The walls of this room, being the room of the owner, are panelled. There will be a ceiling and a floor and, if you are fortunate, and stumbled on a better sort of house, there might be some small glass windows but there won’t be a fireplace. On both sides of the hallway there will be rooms. You’ll find one of them to be a kitchen, a room to eat in, the dairy, and the servant’s room. If you are looking for lang lang lang lang lang lang amma and avi, you’ll probably find them here if they aren’t cutting hay or milking sheep. These rooms won’t have any ceilings or floor. There won’t be any wood panelling. If there are windows they’ll be made from a hoop of wood with the intestines of a sheep stretched over it. There will be no chimney and no fireplace. So, if you woke up on a dreary, wet day, and hiked to the closest house, there’d be no place at which to warm yourself. There might be some stones on the floor making an enclosure and in that there’ll be some dried manure burning—that is, if food is being cooked or heated. Hopefully, you don’t have asthma, because with no chimney, the smoke spreads throughout the house before it escapes through a hole in the roof. In the more prosperous farms, there may be a shed for storing fish, and another for people’s clothes, and a stable for the sheep and cows. However, if you come across a poorer sort of farm, everything will be in one building, dried fish hanging from the ceiling (watch your head), very low beams (watch your head), there will be no furniture except the beds people sit on along the walls to eat their meals and which they share, sleeping head to foot. There won’t be any privacy but you probably won’t care because there are no stoves, no fireplaces and hardly any fuel so people sleep together for body heat. Fleas may be a problem but you’ll need to get used to it. They’re a problem everywhere and there are no convenient insecticides. The people, unless it is a time of famine, are hospitable. They are known for being kind and generous. They’ll almost certainly provide you with shelter and food and expect no payment, although a gift would be appreciated when you leave to try to find your way back home. If you’ve stumbled into a better off farm, you may even get a mug of cheap Danish brandy to send you back the way the brennevin has propelled you. So, there you are, a few drinks of Black Death have transported back to Iceland in 1772 and you’ve wakened hungry. What’s to eat? You start walking and what you get, if you get anything, because that will depend whether or not it is a time of plenty or a time of famine. Surprisingly, if you do get something to eat, traditional food has changed so little since 1772, that you would recognize some of it from Thorrablots. You’d be served milk, warm from the cow or cold, and sometimes, boiled. You might be served butter milk, straight or diluted with water. If you get any bread, it will probably be sour biscuit imported from Copenhagen but there isn’t much of this because it is expensive. You might get some rye bread if your host was able to get some from the trade ship because all the rye flour comes from Copenhagen. Your host’s wife will have mixed the flour with some fermented whey (syra) and kneaded it into a dough. She’ll then have made a flat cake about a foot long and three inches thick. She’ll have boiled this dough in water or whey and then dried it on a hot stone or an iron plate. If you host has an iron plate. If you are lucky enough to be offered butter (fat of all kinds is always in short supply), you’ll get sour butter. The Icelanders seldom ate fresh or salted butter. The advantage of that it that it kept for as long as twenty years. According to von Troil, the Icelanders thought so highly of sour butter that they figured one pound of sour was worth two pounds of fresh. You might get served mysost. Or, you might get beinga-ftriug, that is the bones and cartilages of beef and mutton, and bones of cod that have been boiled in whey until they are so soft and fermented that they can be served with milk. If you are fortunate, you might get a piece of dried cod with a bowl of sour butter. If you are on the coast, you’d probably get a drink of blanda, that is water mixed with one twelfth syra which is quite acidic. If it is winter time, you might get some black crow berries in your blanda. That would be good to stave of scurvy. You might get a drink of sour milk. Our host would have paid two-fifths of a Danish rigs dollar for a cask. If you were visiting a well off farmer you might get a drink of beer imported from Copenhagen or he might have brewed some of his own. If you were lucky enough to be at one of the important farmsteads where the farmer owned a lot of land and sheep and cows, you might get coffee. If you were at an ordinary person’s house, you’d likely get a kind of tea which they’d make from the leaves of Speedwell which they could collect wild. Iceland was no different than any other country then or now. If you were an important farmer, you could afford to eat meat, butter, shark and whale. If you were a crofter or hired help, indentured servant, you had to make do with fish, blanda, milk pottage made with rock-grass (Icelandic moss), and boiled and fermented bones. Most of the time, the diets were very monotonous, the ingredients unvarying but adequate. However, Iceland suffered tremendous famines. Large numbers of people died of hunger. According to von Troil, these came about because the ice from Greenland came in great quantities into the harbours and prevented the grass from growing and kept people from fishing. They did ask a wealthy Icelander to provide them with a supper made from Icelandic ingredients. The fish and lamb were wonderful. The dried fish and sour butter were only tasted but the rotted shark drove them from the table. 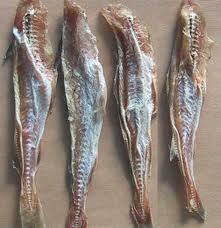 So, there you have it, what you’ll get to eat if you try time travel, Icelandic style. One thing is for certain, unless it was a time of famine, although food was often short, even the poorest people would give you something to eat. When people entered a home, they invoked god, and although we may have fallen away from the church, they took their religious lessons seriously and did as the Good Samaritan for the stranger even though he was of a different faith.